When you drag and drop a body into the Edit window, its position (i.e. the position of its reference frame) will be defined with respect to the base reference frame. You can change the position with the mouse pointer. From the View menu click Mode and Translation or click the button to go to translation mode. If you put the mouse pointer on top of the body, you can change its position by pressing the left mouse button. If you pressing the Ctrl-button at the same time, the body will move up and down. You can also set the position manually by double clicking the body. This will open the Body Properties dialog. The purpose of building a 3D model in most cases is to construct some kind of mechanism using bodies and joints. The joints make the bodies move in a particular way, which can be inspected in the 3D Editor. 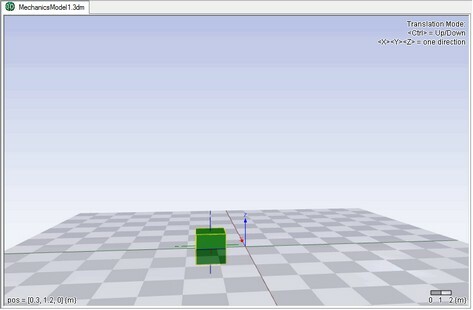 Every body in 3D mechanics editor is floating by default, unless specifically set to be attached to the fixed world, or connected to another body by means of a joint. Any body can be set to be a fixed body by checking the Is Fixed World option in the Body Properties dialog. Changing the position of a fixed body in a mechanism will change the base position of the mechanism. Dragging the other bodies will only make the mechanism move, but not change the base position. If you want to model a floating mechanism (e.g. a satellite in space), all bodies should remain floating. To set the orientation of a body, the same procedure can be followed as for the position of a body. If you set the Editor in Rotation mode ( ), you can change the orientation of the body with the mouse pointer. You can also use the Body Properties dialog to set the orientation precisely by clicking the orientation button. The orientation of a body is specified by the orientation of its reference frame. You can define this orientation using various representations. • Direction Up Vector: Using the Direction Up vector method you have to specify the Y-axis (Direction) and Z-axis (Up) of the body reference frame. 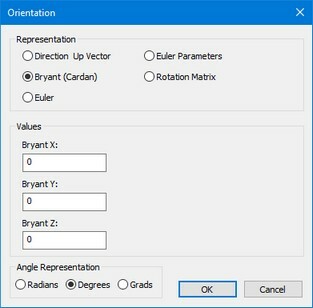 • Bryant angles: Using Bryant angles we start with the initial body reference frame. First we rotate around the X-axis of the body reference frame, then we rotate around the Y-axis of the body reference frame en finally around the Z-axis of the body reference frame. Bryant angles are also known as X-Y-Z relative Euler angles or Cardan angles. • X-Y-X Euler: Using X-Y-X Euler angles we start with the initial body reference frame. First we rotate around the X-axis of the body reference frame, then we rotate around the Y-axis of the body reference frame en finally around the X-axis of the body reference frame. • Euler Parameters: Using Euler parameters we start with the initial body reference frame and rotate this frame around a vector K [X,Y,Z] about an angle theta. • Rotation Matrix: Using a 3x3 rotation matrix, you can enter 9 elements that will transform the initial orientation of the body reference frame to the new orientation. Each body has a mass and rotational inertia. The mass indicates the resistance of the body to a change in position. Given a fixed force, a body with a large mass will accelerate more slowly. This property is the same for all directions. Therefore the mass can be indicated by a single parameter. The rotational inertia indicates the resistance of a body to a rotation. Given a fixed torque, a body wit a large rotational inertia will start to rotate more slowly. The rotational inertia is not the same for all orientations. Generally, for any body three axes can be identified that indicate a stable rotation. The rotational inertia for these three principal axes of rotation is sufficient to describe the motion of a body. 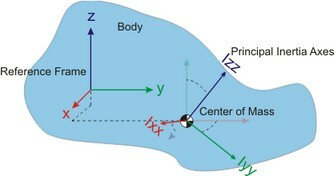 The connection of these three principal axes of rotation is generally known as the center of mass. Any body, indifferent of its shape, which has the same mass, the same principal axes of rotation and the same rotational inertia, will show the same dynamic behavior. That is why you can change the representation of a body to any size, it will not change its dynamic properties. If you open the Body Properties Dialog you can click the Edit button to change the inertia properties. 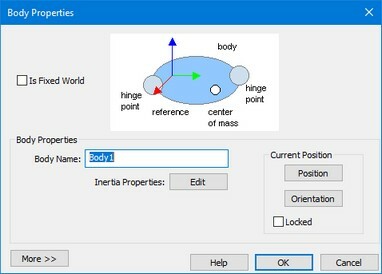 You can set mass and the rotational inertias for each of the principle inertia axis. 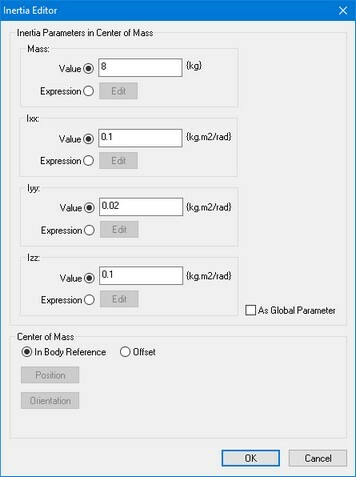 By selecting the option As Global Parameter you can make the inertia parameters available as global parameters. The center of mass does not necessarily have to coincide with the body reference frame and the orientation of the principal inertia axes do not have to coincide with the orientation of the body reference frame. You can enter the offset position of the center of mass and the orientation of the principal inertia axes, by clicking the offset button. If you click the More button in the Body Properties dialog, options are shown which form a shortcut for the normal way of building models. They are meant for experienced users. First a list of connection points are shown and some buttons to edit these points. Connection points are used to indicate at which point a joint or other element is connected with the body. Connection Points are explained in more detail in the next section. At the bottom two options are shown. If you choose the Generate Power Interaction Port option, a power port will be added to the body, which allows you to insert forces and torques onto the body, from other 20-sim submodels. The Output Absolute H-matrix option, will create an 4x4 output signal that gives the position and orientation of the body, using an H-matrix. This signal can be connected to other 20-sim submodels.